‘Stars Chandelier With Blown Glass’, we can custom design this chandelier in different size and style stars. The showing price is for a chandelier with 6 tin plate stars with one marble total size is 3′ H and 4′ W including stars. STARS Diameter (2) 20in, (2) 16in, (2) 12in. “Custom Stars Chandelier-Blown Glass”, we can custom this chandelier in different size and style stars and any blown glass lamp from our catalog. 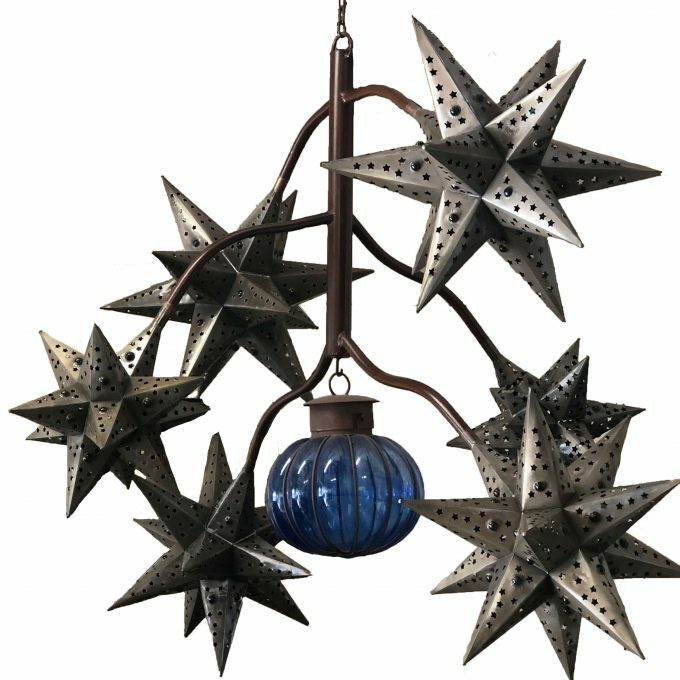 The showing picture is a star chandelier with 6 tin plate one marble stars and a blue “Calabaza” . The price vary depending the model and size, if you are interest to custom a different design please contact us by email and we are happy to help you, we can do any modifications depending your needs. The chandelier comes wired and ready to hang on your ceiling to enhance its beauty and finish your room with elegance. Price is depending all its features. Please send us an email with all your questions and ideas.